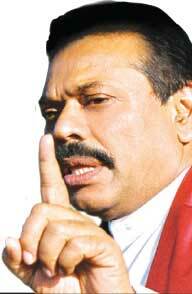 Former President Mahinda Rajapaksa yesterday said that underworld gangs that fled the country during his tenure had been brought back by the politicians of the present government to do their political dirty work and those dregs of society were behind the present crime wave. He said that narcotics were the main reason for underworld warfare and during his time the then Defence Secretary had waged an anti-narcotics war to keep the underworld elements at bay. "Many underworld characters fled the country to evade arrest. Powerful politicians of the incumbent government brought them back to get their dirty work done. Now, the underworld gangs go on killing one another to settle their old scores," the former President told yesterday.